In Panama, real estate tax, also known as property tax, is not municipal, but national and the entity responsible for its collection is the Ministry of Economics and Finance located on Ave. Peru, in Panama City. It must be paid according to the official assessment value, which is usually the declared value on the sale document. Real estate located in Panama, whether urban or rural, is subject to property taxes. 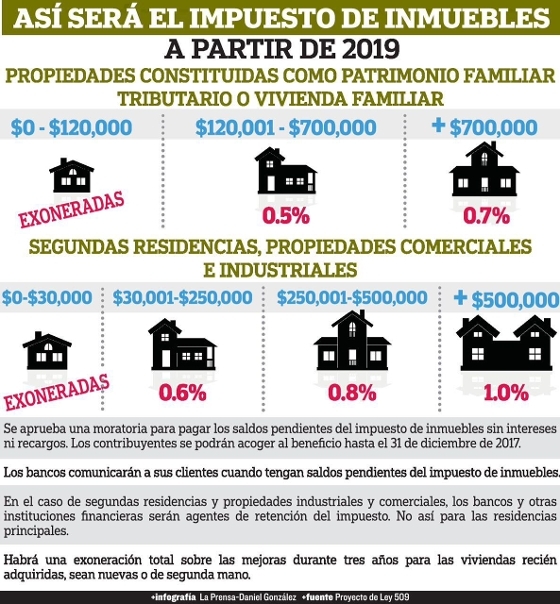 The tax base depends on the total value of the land, plus all improvements, as appraised by Land Commission (Oficina de Catastro), and if it is your principal residence, second residence, commercial, etc. Real estate transactions at prices above the appraisal value automatically increase their value for tax purposes. - Over the declared value of the improvements built. 4. 1% for property valued over $500,000.00. Certain properties and improvements are exempt or can obtain exemptions from real estate taxes according to special incentive tax laws. In order to have received a 20-year exoneration on improvements, construction permits would have been need to be approved by July 1st, 2009 and need to be filed via the Public Registry before December 31st, 2011. Right of Possession (ROP) properties do not incur property taxes, since the property technically belongs to the government of Panama. Property taxes cover the fiscal year that runs from July 1 to June 30. Individuals also can pay half of their property taxes on or before August 15, and pay the other half on or before January 15 without interest and penalty.